How do you choose to group things when you’re putting them on shelves, in cabinets, in closets, etc.? To do this, she had four taxonomists, who usually deal with things like beetles, discussing the taxonomy of candy. And the taxonomists had fun with it. Olivier Rieppel said, “Organisms you classify according to their evolutionary relationships. With candy or office furniture or whatever you classify according to similarities.” So they wound up suggesting classification based on contents (chocolate covered or not, for example), by shape, by size, and by color. Besides making me crave some candy, the Brain Scoop video made me think about the many ways you might choose to group things in your home of office. Just as with candy, you can use any groupings you want, as long as they work for you. These classifications can be nested (by author within a genre, for example) and combined. Sometimes you might need to compromise from your ideal grouping to accommodate the storage space you have, especially when it comes to oversized books. While some may question your choices — as with the candy, some people mock those who group books by color — whatever helps you find the right book when you want it is the right system for you. Type: pants, T-shirts, coats, etc. 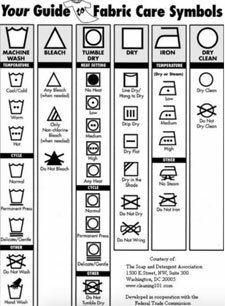 If the groupings you’re currently using for your books, clothes or other items aren’t working for you, think about what might work better and give it a try. For many, dealing with email can be a full-time job. New messages arrive before you’ve attended to the old. What’s worse is that messages can be lost, misdirected, or marked as spam and unintentionally end up in the trash, and finding the important emails among so many duds is a real time-waster. In my constant pursuit to get email under control, I’ve found a fantastic service that I’ve been using for months now that is helping me to effectively deal with my email woes, and it is called SaneBox. To use SaneBox, simply create an account by entering the email address you wish to tame. Right away, SaneBox begins analyzing your email history, noticing the addresses you respond to, and those you don’t. Right here I want to address the security questions that some of you probably have. When I started researching this software, my first question was, “Wait, they’re accessing my email?” Well, no. First, email never leaves your server. SaneBox does not take possession of your messages. Also, they only look at the email headers, which are composed of the sender, receipt, and subject. They look at the patterns in your email behavior (messages you’ve opened, responded to, etc.). In other words, they’re not reading or downloading your email. Phew. Back to the service. When the setup process is finished, SaneBox creates a new folder in your email software for you called @SaneLater. The messages flagged as “unimportant” during that initial analysis are moved there. The rest, or the “important” messages, are left right in your main inbox as usual. The result: you only see the messages that mean the most when you glance at your inbox. This has saved me huge amounts of time. Messages moved to @SaneLater aren’t deleted, so don’t worry. They’re simply in a new folder. While SaneBox is learning, it might place a message in @SaneLater that you consider important. In that case, simply move that message to your Inbox and future messages from that sender will stay in your Inbox. After a few days of training, I just let it go with my full trust. I’ve gone from around 40 messages per day to six or seven. There are other options beyond the @SaneLater folder, all of which are optional. 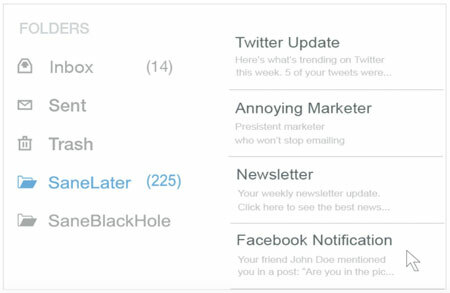 @SaneBlackhole ensures you never see future messages from a certain sender. @SaneReplies is my favorite folder. It stores messages I’ve sent that haven’t yet elicited a response. @SaneTomorrow and @SaneNextWeek let you defer messages that aren’t important today, but will be. What’s nice is that SaneLater doesn’t care if you’re using Mac OS X, Windows, iOS or Android. It also sends you a digest (at a frequency you determine) of how messages have been sorted, in case you want to make any adjustments. SaneBox offers a 14-day free trial. After that, there are several pricing tiers, available on a monthly, yearly or bi-yearly schedule. There are numerous tools on the market to help you organize your goals, and I’ve recently began to use one that might also interest you: The SELF Journal. This little notebook is something I backed on Kickstarter back in 2015. 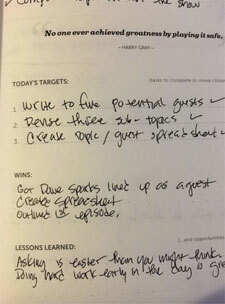 After receiving my journal in December, I used it to successfully plan and implement a new season of my podcast. The experience was so positive, I’ve decided to share it with you. Are you setting goals effectively? The problem with goal setting is that many people do it in a way that doesn’t help them to achieve their goals. Many set unrealistic goals (run a marathon next weekend without any training), underestimate completion time, or fail to review progress. Another big hiccup is not having a plan. Let’s say you set a goal of organizing the garage, top to bottom. Simply saying, “I’m going to organize the garage this weekend,” isn’t enough and probably won’t work. The SELF Journal, aside from being well-made and attractive, features a built-in system for moving toward a goal effectively, day by day. You create a 13-week roadmap. Many poorly-crafted goals lack a distinct beginning, middle, and end. The SELF Journal helps you to create this timeline and write it down. A procrastination-busting calendar. You’re encouraged to fill every working time slot with a relevant activity. No, “just checking Twitter real quick” does not count. Prioritized planning. You’re meant to plan tomorrow’s tasks today, so you’re clear on what’s to be done in the morning. There are two more aspects that I really like in the journal. The first is tracking and reflection. The journal provides space for you do reflect on your wins for the day and what you’ve learned. The wins emphasize the last aspect of the system — bookending your day with positive psychology — while the opportunity to record lessons learned informs future work. The book’s morning routine emphasizes the preparation and work, while the evening routine highlights reflection. I’ve been quite happy with it and I suspect others will also find it beneficial. Its current price is $31.99. According to the U.S. Census Bureau (PDF), the average travel time to work (one way) in 2011 was 25.5 minutes. Of those who worked outside the home, 8.1 percent had commutes that were 60 minutes or longer. That means the average person spent 4.25 hours commuting each week, and a significant minority spent 10 hours or more. If you’re one of those people with a sizable commute, how do you make good use of that time? The answer will vary depending on whether you drive, bike, or take public transit, but the following are some suggestions. I’ve already written about how dangerous it is to talk on the phone when driving, even if you’re doing it hands-free. And obviously texting is dangerous, too. If you need to check your messages or reply to a call, please find a safe place to pull over before responding. If you’re driving, you can listen to informative radio shows or put interesting podcasts and audio books on your smartphone or other mobile device. Also, a number of universities provide free audio lectures on a wide range of subjects. You can also save articles from the web to the Pocket app and then use the “listen” function to have them read to you. If you’re using public transit, you can obviously expand your possibilities to include magazines, newspapers, physical books, e-books, etc. Podcasts, audio books and such don’t have to be educational — they can be just pure fun. Sometimes it’s nice to just get lost in a good novel. Or you might choose to listen to music, either on the radio or on your mobile device. The right music might put you in a good mood to begin the day or might help take the edge off a not-so-wonderful workday on the way home. If you’re using public transit and have an Internet connection, you could use the time for reading and updating social media, such as Facebook or Twitter. The idea is that you are continuously aware of three things: your body, what you see, and what you hear. This is what it is to be mindfully present as you drive. If it isn’t feasible to leave work behind, and you’re using public transit, you could use your commute time to handle some of your email. You might also update your to-do lists or take some time for planning and strategizing. If you’re driving, it can sometimes be nice to have a commute partner. Some years ago, I drove to a yoga class that was a half hour from home with someone else from my area, and we both enjoyed getting to know each other better. It even led to a job for me. Epley and Schroeder took their experiment to the subway. They randomly assigned three groups of commuters: One was instructed to connect with a stranger, one was asked to remain disconnected, and the control group commuted as they normally would. While participants predicted their ride would be more enjoyable sitting in solitude, the research team found the exact opposite — those asked to engage in conversation reported a more positive, and no less productive, experience. How do you use your commute time? Let us know in the comments. There are certainly benefits to owning fewer things. Derek moves every year or two, so owning very little makes those moves easy for him. Owning less stuff also means there’s less to collect dust, which can be important to those with allergies. And you can choose to rent or buy a smaller home, thus saving money. Of course, you also save money by buying fewer things — or you might spend the same amount but find you can afford to buy things of higher quality. And you certainly don’t need to be a minimalist to be uncluttered and organized. If everything you own has a home, can be found when you need it, and makes you happy (or serves a vital purpose), you’re doing just fine. Some people like a house or apartment that’s sparsely furnished while others enjoy filling their homes with art, books, music, mementos, cherished collections, etc. That’s a matter of personal preference, and people on either end of the spectrum can be organized. Of course, having fewer things can make it easier to get organized and stay organized. It’s easier to find a place to store everything when there isn’t as much to be stored. It’s easier to put something back into a closet or drawer that has plenty of empty space than into one that’s close to full. If you want to do any home projects such as painting the walls or replacing the carpet, those projects will go quicker if you don’t have as much to box up and move out of the way — and then move back and unbox. On a now-defunct blog I’ve had bookmarked for years, someone wrote about his approach to his possessions, which he called mediumism. As he explained, “I buy only what I need, but I have no desire to live with just 100 things. I watch very little television. … I still plan to keep my 32-inch LCD for now.” If minimalism feels wrong for you, maybe mediumism will resonate. Just remember that the idea behind uncluttering is to have a home that pleases you and supports you in achieving your goals. That may mean you own 150 things, 1,500 things, or 15,000 things. There’s no magic number — there’s only the answer that’s right for you. Yesterday, I wrote about my transition from being chronically late to being perpetually early. This was quite a journey that required some serious reflection, as well as behavior change. There’s a secret I didn’t share with you yesterday that I’ll divulge today, and it’s the little app that’s been a big help: Google Now. It’s billed as an “intelligent personal assistant,” but really it’s a suite of services that’s closely tied to your Google account. There are free mobile apps for iOS and Android, which I just adore. The following is and explanation of how I use Google Now every day. For example, let’s say you have an appointment across town that begins at 12:00. Google Now does so much more than remind you of the pending appointment. It notices where you are, estimates how long you’ll need to get there, and prompts you to leave about five minutes before you need to, based on distance and traffic conditions. It even polls for traffic and picks the quickest route for you. Here’s my other favorite trick. I can tell Google Now that my daughter has dance class from 12:00 – 3:00 on Saturdays. Not only does it prompt me to leave in time to arrive before noon, it also lets me know when class is about to end, so I can arrive in plenty of time to pick her up. There are a slew of cards available, which can help you find fun things to do, monitor sports scores, get the latest news, and so much more. For me, it’s all about the scheduling. And, if you use Google Calendar, integration is seamless. Note that Google Now is most effective when you have a Google account and actively use its mail and calendaring services. That stuff is free, which is another bonus. 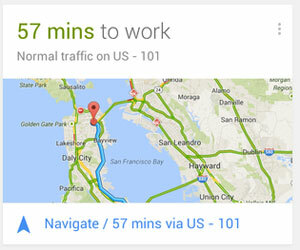 I don’t typically gush over software but Google Now is something I use every single day. It helps me do what needs to be done in an elegant, effective, an unobtrusive manner. I recommend checking it out. As the person who was voted by his classmates “most likely to have a tardy slip” in eighth grade, I’ve had a lot to overcome when it comes to punctuality. If someone were to ask me about why I was often late, my most common answer would have been some variation of “I ran out of time.” Does this sound familiar? Additionally, I thought that arriving earlier than I needed was a waste of time. Why sit in the parking lot and do nothing for 15 minutes? Also, there’s a rush that can accompany sprinting out of the door at the last second. I believe that I was into that rush for a while, at least subconsciously. Waiting until the last possible second generated an adrenaline release that accompanied the sudden, pressing flurry of activity, and that was something I enjoyed. Once I recognized that’s what was going on, it was time to address it. And, surprisingly, all I did was create a simple pro and con list regarding my persistent tardiness. On the “pro” side (if you can call it that) was the thrill of adrenaline and the other reasons I already mentioned. The con side was much longer, and much more convincing: chronic stress, disappointing others, disrespecting others’ time, shoddy work, etc. With that in mind, I decided to be chronically early. You have time to relax and prepare before an event. Arriving 15 minutes early isn’t a waste of 15 minutes, it’s a gain. Look over your papers. Review what you’re going to do or say in your head. Or, just sip your coffee or tea and breathe. Good things pop up. I’ve been in situations where someone has said to me, “Oh, since you’re early do you want to help me with something?” I was able to provide a little unexpected something extra to someone else, which they won’t forget. Bust out some email replies. When I pick up my daughter from ballet classes, I like to be a good 15 minutes early. The waiting room is quiet and cozy with lots of comfortable furniture — perfect for replying to a few email messages. Again, that’s 15 minutes gained, not wasted. Finally, and this is my favorite reason to be early: it gives me time to connect with others. “Why are we so early?” my kids often ask. The answer is so we can talk. Or laugh. Or discuss school or friends. Even 10 quiet minutes in the car or a waiting room can be so nice. Some organization is required to join the perpetually early. Commit to working on projects well before they’re due. Leave the house earlier than you think you need to, and ensure that bags are packed and ready to go the night before they’re needed. You’ll be sipping tea and chilling out while everyone else is speeding along, stressed to the gills in an attempt to show up on time. Welcome to the early club. 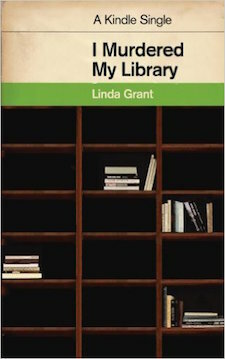 Author Linda Grant needed to downsize her personal library when she moved from a place with all sort of nooks and crannies for books — plus some specially installed bookshelves — to a flat with much less space. (Also, her real estate agent saw her huge number of books and told her something had to be done in order for the house to sell.) She wrote a Kindle Short entitled I Murdered My Library about the experience, which perfectly captured the mixed feelings so many people have when they consider downsizing their book collections. On the one hand, there was a lot of sadness about giving up a library she’d been building since she was a little girl. Since the author is British, American readers may not recognize some of the specific authors and titles she collected back then, but the passion for books is definitely recognizable. However, there were certainly some issues with that book collection. Some were books she had no need for, such as multiple copies of her own novels, sent to her by her publisher. She had those books in various translations, too. She also mentions the “books I did not particularly care for, but kept anyway” and the “non-fiction which I kept in the era before the internet” in case she ever needed specific nuggets of information. Grant is no technophobe, and she embraced her Kindle as a way around the print-size problem. And she reveled in how much easier it was to carry the Kindle than a 900-page book, and how nice it was to have “a library in my pocket.” But while new releases are available in digital format, a lot of backlist books (and much of her collection) are not available yet. And then there was the problem when her Kindle died at the start of a four-hour flight, leaving her with only the airline magazine to read. I’m not going to re-read these books before I die. I am just bequeathing my nephew and his wife the heavy task of removing them at a later date. What did she do with the books she decided wouldn’t make it to her new home? She gave the multiple copies of her own books to reading groups, charging just for the price of postage. She gave the translated books to libraries. As she noted, “Polish speakers in the London Borough of Haringey now have a choice of books: by me, or by me.” And the rest got donated to an Oxfam shop, where the sale benefits the charity. But still, the empty shelves bothered her. There are not enough books here. The sight of the bare shelves shames me. What have I done? At just 28 pages, this is a quick read and one that many people struggling with overflowing bookshelves will appreciate. I really like to travel. Whether it’s a week exploring Paris or a free afternoon in a neighboring town, I’m game for it. It’s such fun to see new things, meet new people, and discover new treasures to visit or experience again and again. 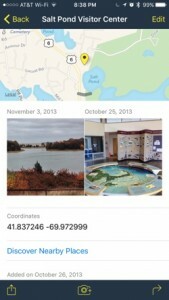 Years ago, I recorded my travels with Gowalla, the now-defunct location-based social network that let you record your trips while turing it into a bit of a game. Today, I use Rego by Makalu Interactive and have for years. It’s a simple app designed to let you note the places you’ve been, as well as spots you hope to visit someday. It’s not a social network — though sharing options do exist — but more a personal, private database. To me, that’s a big plus. Rego is simple and straightforward. (Tour the app.) Up top you see a map depicting your current location; below, a list of your favorite places. You can “pull” the map over the list for a larger, distraction-free view. Your current location is noted by a blue dot, while points of interest you’ve previously noted appear as yellow dots. As for the list of spots, tap any one to view its details, including notes you’ve written, any collections it belongs to, GPS coordinates, date added, and more. There’s even an option to discover nearby places, further adding to Rego’s usefulness. What I like about this app: Rego is a list for me. There’s no liking, sharing, thumbs up, or comments to post out of obligation because someone you knew 25 years ago said something about a pizza place you both visited in the ’80s. Instead, Rego is a list of places I love at home and abroad. I can share if I want to, but… I don’t. Instead, I add a spot by traveling to it, tapping the “+” icon in the upper right and tapping Save. Once that’s done, a new screen is created for that spot. From here I can add a note, snap a photo, and read an inspirational quote. It’s all quite easy. Rego also lets you add spots you hope to visit, or aren’t currently occupying. To do so, pinch the map to zoom out. You’ll notice a target icon appears. Move that to the location you’re after and then create a new spot as described above. It isn’t entirely accurate, but I’ve been assured that you’ll be able to add spots via address in a future update. Rego is quite nice. It’s easy to whip out and record your travels, and just as useful when browsing or searching for new places to visit (pull down on the list of saved spots to reveal the search field). You can also opt to open any spot in a maps app, like Apple’s Maps or Google Maps for iPhone. Now you’re a tap away from travel directions. Years go by, technology improves yet many of us continue to carry a huge collection of keys. Throw in a few fancy keychains, customer loyalty cards, and next thing you know, you look like an old-time jailer walking around. I even knew someone who damaged the ignition system of her car by having a heavy keychain pulling down on the steering column for months and months. The following are a few ideas for getting an out-of-control key collection under control. First and foremost: separate your keys into logical groups. Put work keys on their own ring, home on another. Perhaps the garage and the shed can live on their own as well. I keep the shed and basement keys separate from the car keys. While you’re at it, make it easy to find the key you need at a glance. Your local hardware store probably has decorative blank keys that they’ll use to make copies for you. Use, say, a beach-scene key for the shed. Or, order up a custom key tag (or even a humorous one) that you’ll recognize in an instant. Lastly, and this goes without saying, ditch any keys you no longer use. The same goes for customer loyalty cards. If you don’t frequent a store anymore, or if a given promotion is over, you don’t need that card anymore. Smartphone owners can use an app like Keyring (available for iPhone and Android) and keep a digital version of the card and skip putting on your physical keyring completely. Get those keys under control! Your pocket — and your car — will appreciate it.